Should you be a hunter shopping on a budget for a rangefinder, you will find the Simmons 801600 Volt 600 a pretty decent choice. With detection range for calculating distances between you and your prey of up to 600 yards, it is a reasonably good pick, and it also comes with other specifications that will convince you that it is a good option for your needs. It is easy to use, as it has a one-button operation that anyone, including beginners, will find optimal and handy. The specs tell us a few critical aspects of this particular model. It has a magnification of only 4x, which is inferior to other models on the market, but let’s not forget that it is an inexpensive unit, so such things are expected. The range goes from 10 yards to 600 yards, which is commendable for a product this cheap, and the one-yard accuracy adds value. You can have the unit measure the distance for you in yards or meters, depending on what your needs are. It works with a Class 1 laser that is safe for the human eye, so you will have nothing to worry about in this respect. The total body weight is 9 ounces, and that happens because it works with a 9-Volt battery, which is quite common and easy to find, but somewhat heavier than what other rangefinders use. When talking about rangefinders, the first thing on the list should be the range. If that is satisfactory, then everything else comes as secondary considerations. In this case, you will be pleased to learn that the Simmons model has a top range of 600 yards. It may not be outstanding, but it is not a bad number, either, seeing that you will not break the bank to purchase this model. One of the most critical features is called the Tilt Intelligence. It works pretty much as an angle compensation feature, to give you accurate readings when there’s a slope or a hill between you and your target. When you have to deal with targets for which you need the true horizontal distance, the unit will be able to calculate the range accurately. You will find the yardage for the angle compensation displayed under the line of sight value. The vertical design makes it particularly comfortable. It also allows the unit to be lightweight, compact, and easy to carry around. While the 9 ounces for its body mass may be slightly more than what you can see in high-performance models, such a weight is still comfortable for any user. The 4x magnification power may not be superior to other models on the market, but it delivers results nonetheless. Your rangefinder comes equipped with a 20mm lens which will provide you with a clear enough image. The optics are advertised as being crystal clear, and there seem to be no complaints from users in this respect. The manufacturer says that this unit is weather-resistant, but, by no means, should you understand from this that it is okay to submerge the rangefinder in water. Actually, it is not safe even to expose your unit to a light drizzle, as it doesn’t come equipped with waterproof features. Nonetheless, it is a pretty durable model, and you might end up using it for a long time without a problem, as long as you bear in mind its limitations. The package delivered with your purchase is pretty barebones, so this is another thing that you should remember before placing your order. There is no lanyard included with your purchase, although the unit has a hole for it, so you will be able to attach one, as long as you are willing to buy it separately. The model is not sold with a carrying pouch so, again, if that’s something you need, you should be disposed to shell out the money for such an extra. A lot can be forgiven for the low price tag this model comes along with, and the lack of extras is part of it. 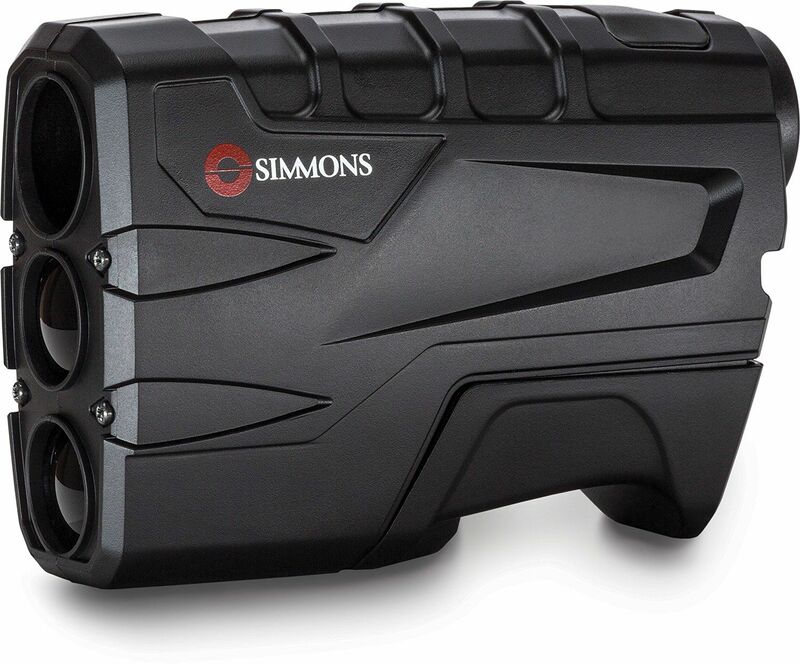 As long as you are not looking for a fancy rangefinder, this model from Simmons might be right up your alley. It doesn’t come with many bells and whistles, but it has a decent range of up to 600 yards and also has a feature that acts as an angle compensation functionality. It is weather-resistant, without being waterproof, and its vertical design makes it comfortable to use.